A one-of-a kind coloring book showcasing tattoo designs by the talented artists featured on Spike TV's Ink Master! 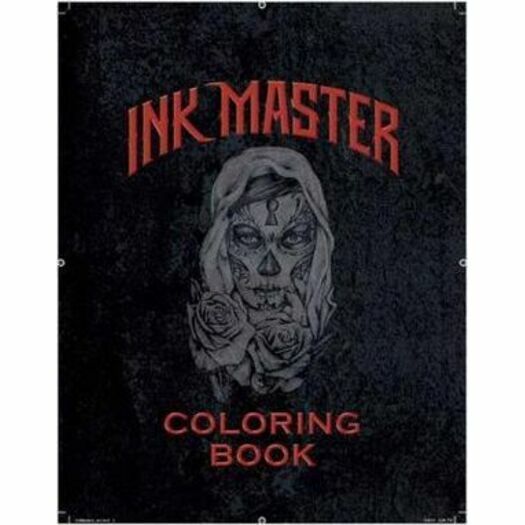 This unique coloring book features eighty-seven original tattoos designs by the talented artists featured on the popular reality series, Ink Master, including detailed designs from Joey "Hollywood" Hamilton (winner of season 3), Scott Marshall (winner of season 4), Jason Clay Dunn (winner of season 5), Dave Krusman (winner of season 6), Jime Litwalk, Cleen Rock One, and more. Also included are twelve four-color, rub-on temporary tattoos. Wash and dry the intended skin surface. Remove acetate covering and place face down on skin. Apply pressure with wet cloth and hold for 30-60 seconds. Gently remove paper and let the temporary tattoo dry naturally. The rub-on temporary tattoo will come off naturally in a few days. It can be removed quickly and easily with baby oil or alcohol cleanser. Wait 10 seconds after application and then rub it away with a cotton ball. Alternatively, you can gently scrub it away with soapy water or use household tape and stick it over the temporary tattoo and peel it off.